As I alluded to in a few previous posts, I have been working on a merged version of both my Windows Phone and Windows 8 libraries on Codeplex: wp7nl and win8nl. 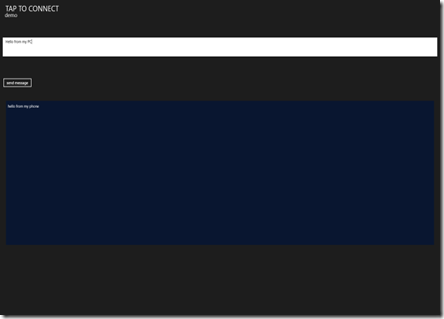 I have now come to the point that I think it is ready for use and/or some community feedback, so I just released WpWinNl to CodePlex and NuGet. The first ‘good’ version is 1.0.1, immediately superseded by 1.0.3 containing the new cross platform DevicePairConnectHelper. 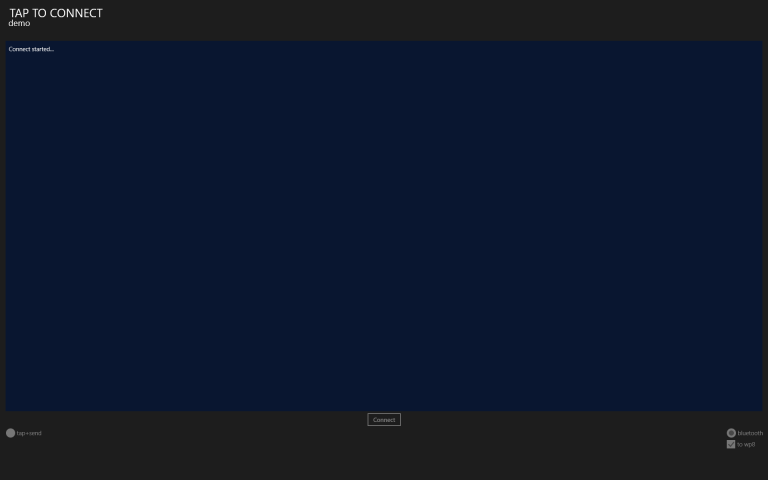 I’ve cut some old stuff that merely introduced dependencies and that no-one used anyway, and I ported stuff that was missing in Win8nl from Windows Phone and back. Provided it makea sense – since there is no FlipView in Windows Phone, I did not port the FlipViewPanoramaBehavior. It is still a work in progress, as any good library should be. What? 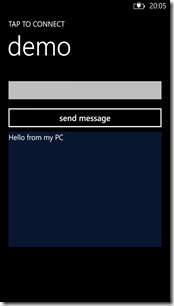 Are you abandoning Windows Phone 7? Yup. Sorry. Gotta move forward. I push you forward into the new era whether you want it or not ;-) . Seriously, I have enough #ifdef code as it is now. And for those that don’t want to go along – the old library wp7nl still exists, and most of the code will still compile under Windows Phone 7. What? Only support for Windows 8.1, no Windows 8 anymore? Is this fully and thoroughly tested? You are now the only dev registered on the project. Are you taking sole control of the project again? Don’t be silly – if you want to contribute as a developer, just let me know. I just did not get around to adding the people that contributed to the ‘parent projects’. Why only platform specific libraries? Why not PCL? Most of the code I write makes at some point use of the System.Windows or the Windows.UI.Xaml namespace. That does not fit into PCL anyway, so at this point I think the benefits of having PCL do not outweigh the extra hassle of having source code in three potential spots. In the old days, making apps in multiple languages was quite a hassle, maintaining multiple resource files and keeping them in sync. In 2012 came the Multilingual App Toolkit, a brilliant piece of technology that changed everything. Suddenly professional localization tooling landed into the lap of John Developer. The tool has a lot of great capabilities – for instance, it can generate translations automatically using Bing Translator. For short texts this works very well, for longer texts your mileage may vary – but you can request for translation from inside the tool, mail it off to a buddy and later import it again. The machine translation at the very least greatly decreases the work of your translator – he or she can skip the 12 instances of Ok, Cancel, Yes, No and stuff like that. So why wouldn’t you use this? Well, I have heard rumors of people claiming to have lost translations. After getting translated texts and importing that translations into your app – at some point the imported translations where partly reset back to English. So I know of some people who kind of avoid the MAT. I did not understand what their problem was, until I ran into it myself. Fortunately I have had the honor of actually meeting the MAT Product Manager twice this year (at both MVP Summits), and that gives me kind of an advantage in gaining understanding what was going on. So I will try to explain to you what happens, and how you can prevent yourself from shooting in the foot with MAT. 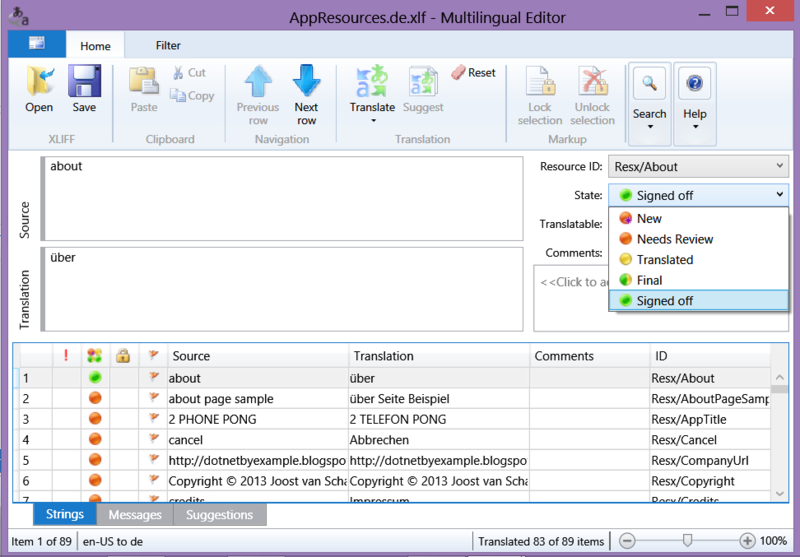 If you start making a localized app, you start out with just making one resource file (using the aforementioned resource file editor), for the default language – usually US/English. Once your apps is done, you fire up the MAT, and start adding languages. The MAT makes an XLF file for every language you add, and – in a Windows Phone app – automatically generates resx files for that. 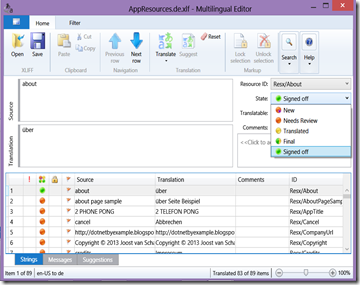 You can prefill those translations using the machine translation option, and like I said, optionally send it off to someone else to review the translation – using the much more translator-friendly editor than the resx file editor. What’s more, they don’t have to have Visual Studio at all – the MAT can run from Visual Studio but also as a simple stand-alone application. Use source control, for example Visualstudio.com. Simply check in your files before you start messing around in your translations and particularly when you want to change your source language texts. The net result – if you suddenly see all your XLF files checked out, MAT has done some potential unwanted processing. You can easily find what is actually changed by finding everything that’s marked red. If German texts are now suddenly English, you have probably been messing around with the original texts. If you want to retrieve the texts that were reset, you can still retrieve them from TFS. For the sake of completeness - if you add a new text, you will more or less see the same result (all XLF files checked out) and suddenly an English text between your translated texts – but that is logical, because it’s a new text that has to be translated, either by machine translation or human translators (again). Currently there is no way to change the MATs behavior in this respect, but f you follow this procedure and keep in mind the rules that drive the MAT, you can use this awesome tool without shooting yourself in the foot. Maybe the tool will be changed to accommodate the more flexible/chaotic way mobile development goes, but that’s for later. Stay tuned. The stuff in Italics is what you add – verbatim. Except for the serviceId. Make and id up yourself, generate a guid, but don’t copy this one. Don’t re-use it over applications. But keep it ready, for you will need it in your code. Start both the Windows 8.1 and the Windows Phone 8 app. Now you can send messages back and forth. 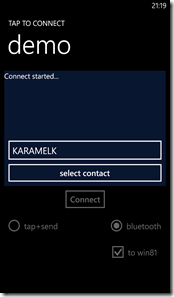 You can still use this component to connect two Windows Phones to each other like you used to, and you now can also can connect two computers to each other and exchange messages. A final piece of warning as far as usage is concerned – if you set ConnectCrossPlatform to true, the Windows Phone 8 will do cross-platform connect – but that’s the only thing it will do. Apparently it can’t find other Windows Phone 8 devices in that mode – just Windows 8.1 computers. For a Windows 8.1 computer, it does not matter – whether ConnectCrossPlatform is on or off, it will find other computers as well as phones. The text “Bluetooth” next to the right radio button is actually wrong on Windows 8.1, since the connection between computer actually uses WiFi Direct. Just like last time – when I added Bluetooth – there was surprisingly little to change. The actual difficult stuff was already found out by Andrea ;-). 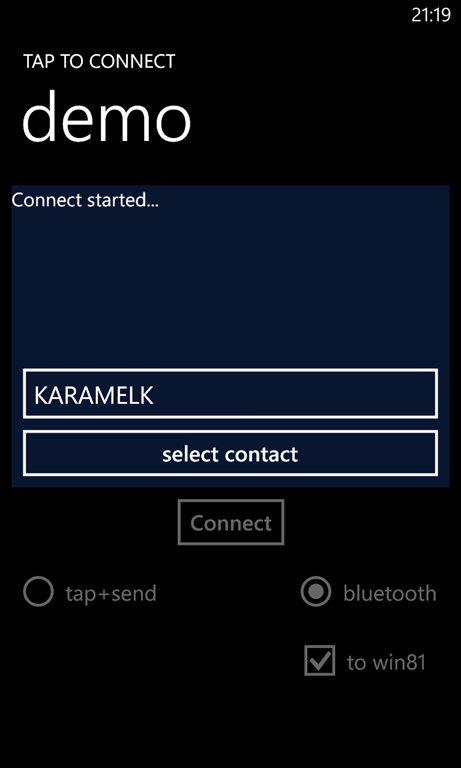 It turns out that on the Windows Phone side you don’t have to do much, but on the Windows 8.1 side you have to resort to some trickery and use the Bluetooth Rfcomm API. The RfcommServiceUuid property looks a bit complex, but it’s only to ensure there’s an actual GUID in it. Then comes the actual cross-platform connecting stuff. Most is just simply taken from Andrea, and for an explanation of what he is actually doing I kindly refer to his post (because I understand about half of it). Important to notice is that I use Bluetooth:SDP in stead of Bluetooth:Paired like Andrea does. If I use the paired option, I get a list of all devices paired to my phone, including my Jabra headset, my Surface Pro, a Beewi Mini Cooper Coupé Red I got on the last MVP Summit and the desktop computer that I try to connect to. I use SDP (Service Discovery Protocol) to find the device that actually provides the one service I am looking for – not so much a Bluetooth connection from a device that happens to be in the list of paired devices. Notice the Windows Store portion actually makes a “RfcommServiceProvider” with the Guid as identifier, and the Windows Phone portion sets that same Guid as a string to the AlternateIdentities. Oh – the Windows Phone version of InitBrowseWpToWin method is a bit convoluted – it’s just a way to make whatever is inside async as well, so it’s compatible with the signature of the Windows 8.1 version. A couple of things have changed here – first of all, the whole component is reset in stead of just the PeerFinder, because there's now potentially much more set up now than just the PeerFinder. The start of the PeerFinder is now in a try-catch because on Windows 8.1 some combinations of parameters cause an exception – while still the connection is set up. This is a typical ‘yeah whatever works’ solution. Then the cross platform stuff is set up – if that is required, and I also check first if the result of the task that returns from the PeerFinder is not faulted, which I did not do in earlier versions either. If a Windows Phone connects to a Windows Phone, it calls the first method. Since this is not a cross-platform call, the HostName will be null, so it will do PeerFinder.ConnectAsync, receive a StreamSocket and proceed to call the 3rd DoConnect method. 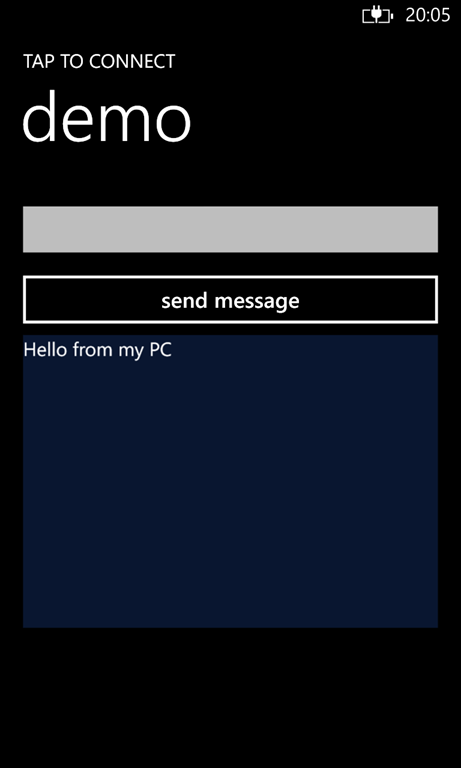 The Window 8.1 computer, upon being connected by a Windows Phone, will get a callback in HandleConnectionReceived (see above, in Andrea’s code) which will immediately result in a StreamSocket, so it call the 3rd DoConnect immediately. For good measure – the 2nd DoConnect method is actually never used in a Windows 8.1 application.